Australian Feral Management carries out a range of measures to control foxes. Their dens can be fumigated and fox trapping has proven to be very effective. For a quick reduction in fox numbers shooting still remains the primary method. Scientists believe that European red foxes were successfully introduced into the Australian bush in 1871, by recreational hunters in Melbourne. By around 1910, the species had spread as far as Western Australia. 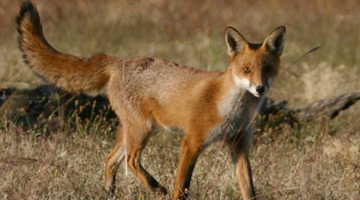 Foxes are now found across most of mainland Australia. They can be found in many different environments, from coastal forests to the arid zone. Foxes have had a devastating impact on many native animals in particular medium sized mammals that live on the ground or partly in the trees, birds that nest on the ground and native turtles. Unfortunately many of these species now only survive on islands or areas on the mainland where foxes are rare. In the urban environment foxes still devastate the native wildlife especially on golf courses where the environment is an ideal sanctuary for wildlife. Foxes dig up the golf course greens and bunkers looking for grubs and beetles, in doing so adding to the workload of green keepers.